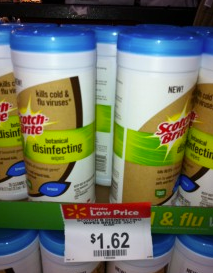 Scotch-Brite Disinfecting Wipes $0.81 each w/ Coupon! Print out this coupon to get a good deal on Scotch-Brite Disinfecting Wipes at Walmart! NOTE: I haven't printed this out yet, but I'm hearing a big ad prints before the coupon, so print out another coupon to skip the ad and save some ink! = $1.62 for 2, or $0.81 each!